Is it an olden or a youngen? Seem to be getting a lot of late bred strays in just now myself. 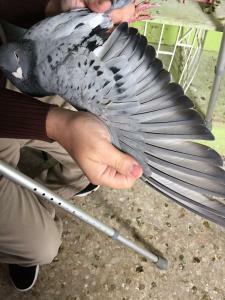 There needs to be some sort of permanent ring introduced that can be attached to the pigeon even if its past the ringing age. Ok it wouldn't/shouldn't be allowed to race on that ring. 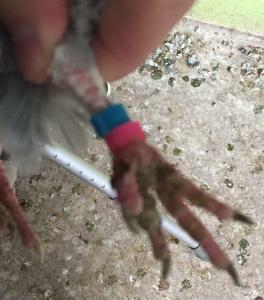 But there should be a ring database for pigeon rings for those who have missed ringing and are breeders or "pets" surely. Something less then a birth/racing ring, but something that wont fall off or break etc and is traceable. If the racing unions weren't so backwards this would have happened 10+ years ago Like all our "charity" raised money not being spent on reducing the bop and preserving our sport. A telephone number ring may have been on this bird and has somehow been removed ? U never know,Mathew might be a gold mine. Remember being told that Ritchie & Whytes “Storm Queen” was bred from a stray bird ? But Not sure if this is correct ? One of her parents came from Jim Croll, Dundee. Not sure if it was a stray or gift ?